In the Marine Corps, certain phrases carry major street credit. “Every Marine a rifleman” is one of them. 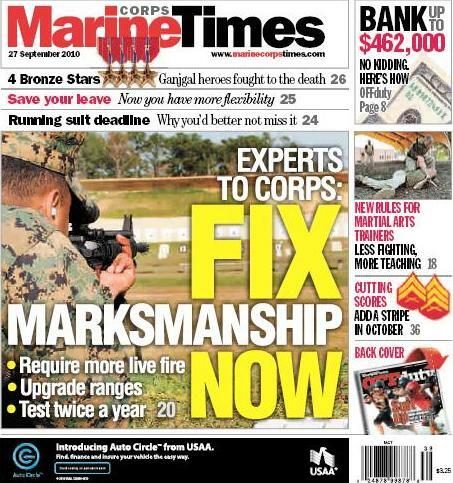 It will likely catch some Marines by surprise, then, that this week’s Marine Corps Times cover story focuses on a variety of problems researchers say they saw in the Marine Corps Marksmanship Program, the outfit charged with making sure that popular phrase holds true. In a controversial report filed late last year, they outline a variety of areas that Marines said need upgrading. The most obvious one antiquated rifle ranges, but they also call for the Corps to conduct rifle qualifications for each Marine at least twice a year, which could create headaches in scheduling for commanders across the service. Marine Corps Times obtained the report through the federal Freedom of Information Act. The study was overseen by Marine Corps Combat Development Command’s operation analysis division and commissioned by Weapons Training Battalion, which disagreed with many of the key findings.